Belize is located in the Western Hemisphere which lies west of the International Earth Rotation and Reference Systems Service (IERS) Meridian (which crosses through Greenwich, London) and east of the 180th Meridian or the Antimeridian which is also known as the International Date Line. For practical purposes, The Western Hemisphere is considered as comprising the continents of North America and South America. Belize lies within the continent of North America which is bounded by the Arctic in the north and Panama in the south. This continent contains large countries like the United States of America, Canada and Mexico to the north. South of these large countries is the Isthmus of Central America. Besides the countries of the Isthmus, the Caribbean islands including Cuba, Hispaniola, Puerto Rico, The French West Indies and the Caribbean Community (CARICOM) countries are also considered to be within North America. The South American continent which lies to the south of the Isthmus of Central America comprises a number of independent countries including Argentina, Bolivia, Brazil, Chile, Colombia, Ecuador, Guyana, Paraguay, Peru, Suriname, Uruguay and Venezuela. French Guiana and the Falkland Islands are also in South America but are dependent states. 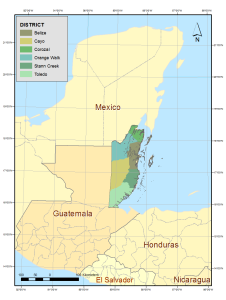 The Isthmus of Central America includes the countries of Guatemala, Honduras, El Salvador, Nicaragua, Costa Rica and Panama. Our country is located on this Isthmus. Belize is located on the north-eastern edge of the Central Isthmus. Belize is also south of Mexico’s Yucatan Peninsula. To the west of Belize is Guatemala and to the south is Honduras. 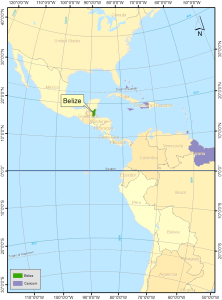 Belize’s geographic coordinates are between 15º 54′ and 18º 29′ north latitude and 87º 00′ and 89º 30′ west longitude. This puts Belize in the Subtropical Zone but Belize’s climate is distinctly tropical. Because of its history and culture, Belize is part of the CARICOM block of countries. The other CARICOM countries are Antigua and Barbuda, The Bahamas, Barbados, Dominica, Grenada, Guyana, Haiti, Jamaica, Monsterrat, St. Lucia, St. Kitts and Nevis, St. Vincent and the Grenadines and Suriname and Trinidad. Most of the CARICOM countries are islands (except Belize, Guyana and Suriname) of varying but small surface area. Belize is the fourth largest CARICOM country. 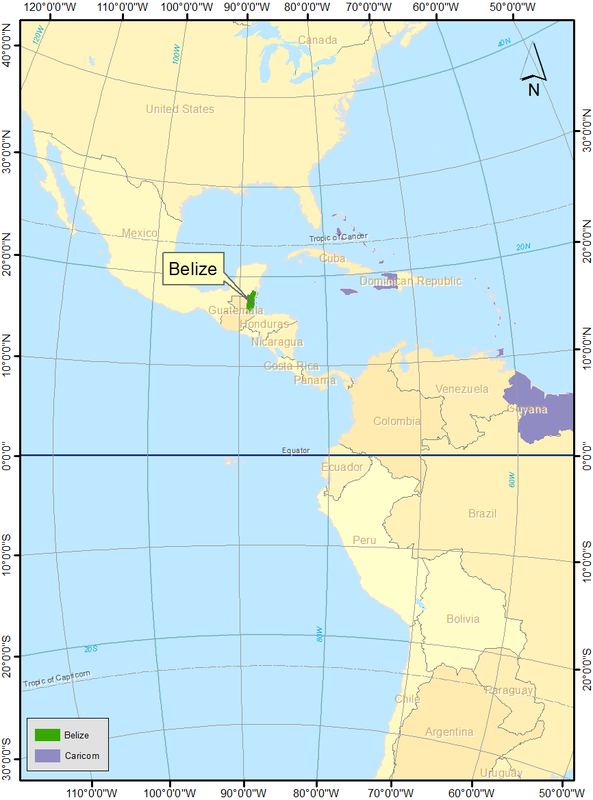 Map of Belize with longitudes and latitudes within Central America and the Caribbean. Belize is one of the smallest nations in the Central American region and in the world. In fact, Belize is the second smallest nation in Central America which comprises other countries including Guatemala, Honduras, El Salvador, Nicaragua, Costa Rica and Panama. Belize has the smallest population in Central America. Belize is bounded in the north by Mexico, in the west and south by Guatemala and the east by the Caribbean Sea. Our border with Mexico starts at a narrow channel at Bacalar Chico that separates Ambergris Caye from the Mexican state of Quintana Roo. From this point the border runs roughly westward through Chetumal Bay up to the mouth of the Rio Hondo. The border follows the Rio Hondo River through its deepest channel and then along its tributary, the Blue Creek until it reaches the meridian of Garbutt’s Falls (approximately 89° 9′ W). From this point, it runs directly south to 17° 49′ N latitude – the border established between Mexico and Guatemala. Thus the borders of Belize, Mexico and Guatemala meet at a location called Aguas Turbias. This border was established by a treaty between Britain and Mexico in 1893. The border between Belize and Guatemala comprises two portions: a southern part and the western border. In the south, the border starts where the territorial waters of Belize, Honduras and Guatamela meet. Because the marine territory in this area is small, Belize, Honduras and Guatemala have agreed not to claim the full 12 miles of territorial waters that each country can claim. The Maritime Areas Act of 1992 states that our baseline is at Ranguana Caye. In the south, territortorial waters extend three miles from the outermost caye to a median line between the territory of Belize and Guatemala. This line extends west to the mouth of the Sarstoon River. The border then extends up the Sarstoon River to Gracias Adios Falls. It is at Gracias Adios Falls that the western border with Guatemala starts. The western border with Guatemala comprises two sections. The first extends from the Gracias Adios Falls in the Toledo District to Garbutt’s Falls in the Cayo District. 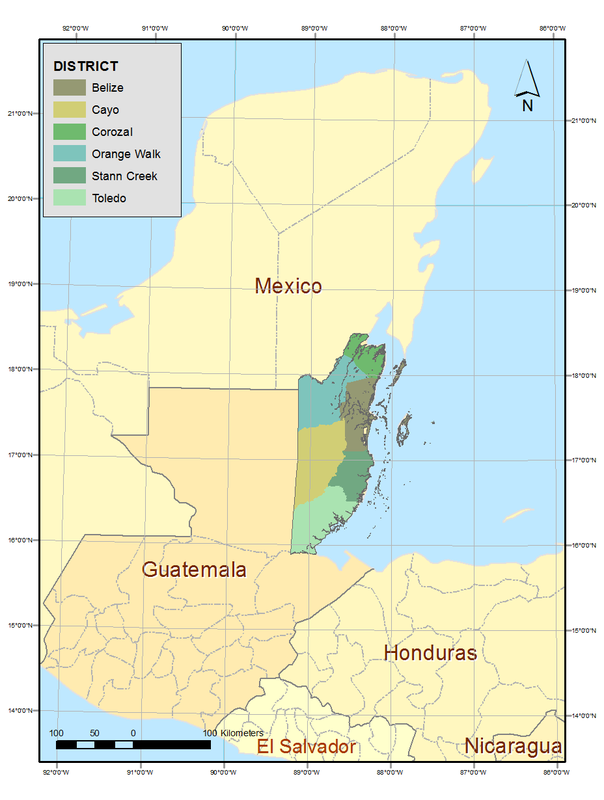 Section two of the western part of the Belize Guatemala border extends northward from Garbutt’s Falls due north to the point in the Orange Walk District adjacent where Guatemalan territory meets with Mexican territory. The total land surface area of Belize (including the Cayes) is 22,966 square kilometers (8,867 square miles). At its most distant points, the width of the country from Belize City to the Western border at Benque Viejo is 109 kilometers and its length from The Rio Hondo to the Sarstoon River is 280 kilometers. Mainland Belize also has 386 km of coastline. Included in Belize’s territory are over a thousand small islands called cayes. These are to the east of Belize’s mainland territory. There are various types of cayes ranging from unvegetated sand cayes to mangrove covered cayes. The northernmost caye is Ambergris Caye and the most southerly range of cayes are the Sapodilla Cayes. The most easterly territory is Sanbore Caye which is part of the Lighthouse Reef Atoll. Belize claims 12 miles of territorial sea beyond its outermost caye. Along with its coastal lagoon, these twelve miles of territorial seas account for 23,660 square kilometers. The total surface area of Belize is 46,626 square kilometers which includes 22,966 square kilometers of mainland territory and the 23,660 square kilometers of marine surface area. Belize also claims an Exclusive Economic Zone (EEZ) of 200 miles beyond the outer boundary of the territorial sea. This EEZ allows for exploration, exploitation, conservation and management of all natural resources in the seabed, its subsoil and the overlaying waters.